A favorite of the ancient Egyptians, the cucumber plant has a long history of cultivation and a wide range of beneficial uses. Learn how to grow cucumbers in order to experience their many useful qualities. Growing cucumbers can be a rewarding new experience to undertake. With some attention and under the right conditions, a cucumber plant will produce tasty fruits. The following growing guidelines will show you how easy is to cultivate and take care of cucumbers at home. Cucumbers require well-drained, nutrient-rich soil in order to thrive. Fertilizers - especially those high in nitrogen content or organic matter that includes nitrogen - are essential to cucumber growth. The plant grows best in soil with a pH of 6.5 - 7.5. Cucumber plants require full sunlight and warm temperatures. The seeds will not germinate below 50°F (10°C), but the soil temperature should be at least 65°F (18°C) before planting. While growing, cucumber seeds require warm nights and days, with a temperature range of 60 - 90°F (15 - 32°C), though daytime temperatures above 80°F (27°C) are preferable. To increase the warmth of the soil, seeds can be planted with black plastic mulch. 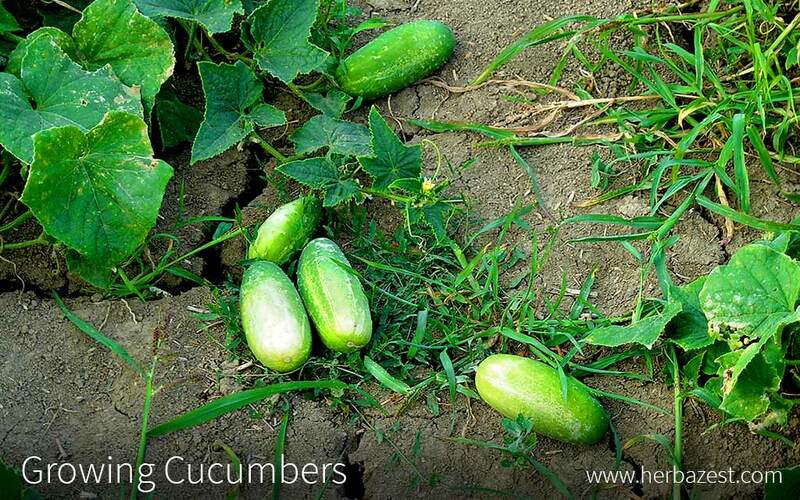 Cucumbers can be grown in rows on flat ground or in hills. To plant in simple rows, seeds should be planted about one inch (2.5 cm) deep and 10 - 12 inches (25 - 30 cm) apart. They may be planted closer together, but will require later thinning to avoid overcrowding. To plant in hills, soil should be made into mounds with a distance of at least five feet (1.5 m) in every direction. Sow four to six seeds per hill. If grown in a warm climate, cucumbers have no specific growing season. However, in temperate climates, cucumbers should be planted after the last frost to ensure the cold temperatures will not kill or damage the plant. Vine varieties of cucumber are often grown on trellises to promote air circulation, provide more direct sunlight, and help the fruits to grow normally. If using a trellis, be sure to position it in the garden before planting the cucumbers to prevent disturbing their roots. Growing a cucumber plant indoors may be done to avoid the frost and then later transplanted outdoors. Plant two to three seeds per two-inch (5 cm) pot. The best pots are peat pots and other varieties that can be placed into the soil with the plant. Thin the seedlings to one to two plants per pot as they grow. Temperature should be kept above 70°F (20°C) during the day and above 60°F (15°C) at night. After three or four weeks, once the weather is warm enough, the seedlings should be transplanted outdoors. Before transplanting, harden the plants outdoors for several days to reduce stress. Seedlings with one or two true leaves survive the transplant best. Be careful not to damage the seedlings' roots in the process. For best results, cucumber plants should be watered deeply and frequently. Overly dry conditions increase levels of cucurbitacin in the cucumbers, which will make the fruit bitter to the taste. However, overhead-watering should be avoided in order to prevent diseases. Drip irrigation methods work well; otherwise, the plant can be watered by hand. Cucumbers require at least one inch (2.5 cm) of water per week in the early stages of growth. Once the fruits begin to ripen, the plant requires less water. Cucumbers are heavy feeders and require plenty of nutrients, especially nitrogen, in their soil. Fertilizers and nitrogen-rich organic matter are necessary for a cucumber's growth. If the nitrogen is deficient, the plant's leaves will become a pale yellow. Cucumbers need adequate space to grow and are prone to overcrowding. If plants are too close to each other, they will not receive needed sunlight, and lack of air circulation can increase the chances of the plants developing certain diseases. The recommended method for avoiding overcrowding is thinning the plants. Once seedlings have multiple true leaves, some should be removed to make space for others. If planted in rows, they can be left approximately 12 inches (30 cm) apart. In hills, they should be thinned until there are one or two plants per hill. Cut plants just above the ground to avoid damaging the root systems of the ones that are being kept. If growing a variety with plants that sprout entirely male or entirely female flowers, be sure to leave multiple of each plant to ensure pollination occurs. Plants should also be pruned to remove diseased or malformed fruits and other parts to avoid infecting the healthy plants. Early on in the cucumber plants' growth, weeds should be removed by hand-pulling. Later, once the cucumbers have become established, they can outgrow new weeds and will even prevent weed growth. Though certain varieties of cucumber are resistant to different diseases, knowing the best ways to protect the plants is an important component of keeping cucumbers healthy. Cucumber beetles are known to attack cucumber plants and cause bacterial wilt. To prevent them from causing damage, cover young seedlings with tents made of netting or cheesecloth. These coverings should be removed before the heat of midsummer. Squash vine borers are another common cucumber pest. These bugs should be removed by hand and destroyed. Cucumbers are also susceptible to aphids, cabbage loopers, cutworms, flea beetles, and stinkbugs. Scab and powdery mildew are two of cucumber's most common diseases. These fungus-related growths occur most often when the leaves of the cucumber plant become damp, or when plants are overcrowded and do not have sufficient air circulation. Keeping the plants dry and thinning them when young helps prevent these diseases. Cucumbers are also susceptible to bacterial wilt and the cucumber mosaic virus, which are both carried by pests, the cucumber beetle and aphids respectively. Plants that are infected should be removed from the garden and destroyed, and the pests should be controlled and removed as soon as they appear. Choose insecticides with care, as cucumber plants can be very sensitive to certain chemical formulas. Other potential diseases are anthracnose and leaf spot. Several wild animals might view a cucumber garden as a convenient place to find a meal. Creatures like woodchucks, deer, and rabbits are known for eating garden plants when hungry, and fences should be put up to keep these wandering animals out. Cucumbers may be ready for harvest beginning in midsummer, depending on the temperature of the location and the date of planting. Their rapid growth means that they may need to be harvested every few days once the harvest season begins. The fruit should be immature and green when picked; once the fruit yellows and its seeds grow hard and woody, it is no longer good for eating. However, mature cucumbers should still be harvested to let the plant focus its energy on younger fruit. Different varieties of cucumber will be ideal for harvest at different sizes. Pickling cucumbers are generally harvested when they reach two inches (5 cm) long. Slicing varieties, on the other hand, are often left on the vine until they are at least one and a half inches (4 cm) in diameter, and they can be anywhere from 6 - 10 inches (15 - 25 cm) long. Once the immature fruits have been harvested, they are ready to be stored. Fresh cucumbers can be stored for 10 - 14 days in a space kept between 50 - 55°F (10 - 13°C) and between 90 - 95% relative humidity. To keep cucumbers any longer than this, they would have to be preserved. The most common - and most effective - method of preserving cucumbers is pickling. This is usually done by fermenting the cucumbers or by using a vinegar solution, but there are simpler methods for pickling as well, generally by adding preservatives and storing them in the refrigerator or freezer. Pickled cucumbers can last for up to a year, but have lost much of their nutritional benefits due to the pickling process. Many pickling recipes are best if used with a pickling variety of cucumber, but some recipes are intended for slicing varieties as well.